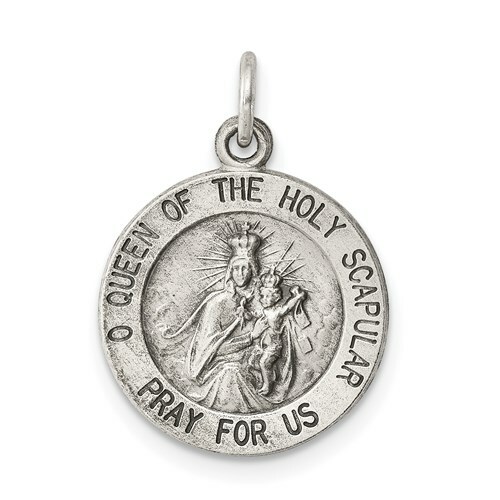 This round our lady of the Holy Scapular medal is made of sterling silver. Item size: 5/8 inch tall by 5/8 inch wide without bail. This item is smaller than a dime. Weight: 1.37 grams. Chain not included. 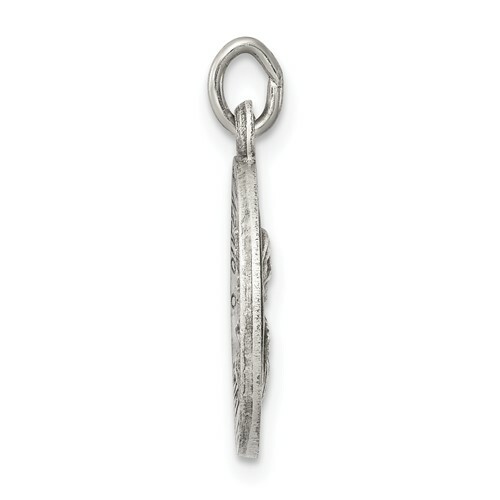 Everything I have bought from Joy Jewelers has been of the upmost quality. They are the best priced out there and their jewelry is excellent. They also ship within the week so there isn't much wait time. I highly recommend this company to anyone. Medal was smaller than I thought. I had my jewler make them into earrings. I wish the actual size would have been shown. They were smaller than I thought. I wear my Holy Scapular every day and night - it stays around my neck always. I'm not the type to write reviews because I tend to be lazy but I had to read alot of reviews and do alot of research to find this scapular. It's just the right size for a girl to wear not to big not to small. Simple and at a very good price. Haven't had any problems with it falling off or anything. Thank you!